We decided to extend our visit to Chicago for an extra day, after necessary business was concluded, because a cold front came through and weather conditions became exceptionally nice. After a trip across town with the Airstream (an urban towing “adventure” that I’ll blog another day) we returned to the McCormick Place Truck Marshalling Yard for another night. After three nights the truck yard feels like home. It’s not nearly as scary as it first seemed. We’re accustomed to the noises: the occasional bang of a tractor trailer hitching up, the clack-and-whoosh of commuter rail zipping by, the night-time jackhammering on the Rt 41 overpasses during construction, etc. It feels like we could spend a lot of time here if we wanted to. At this point we have two limitations: fresh water and electricity. 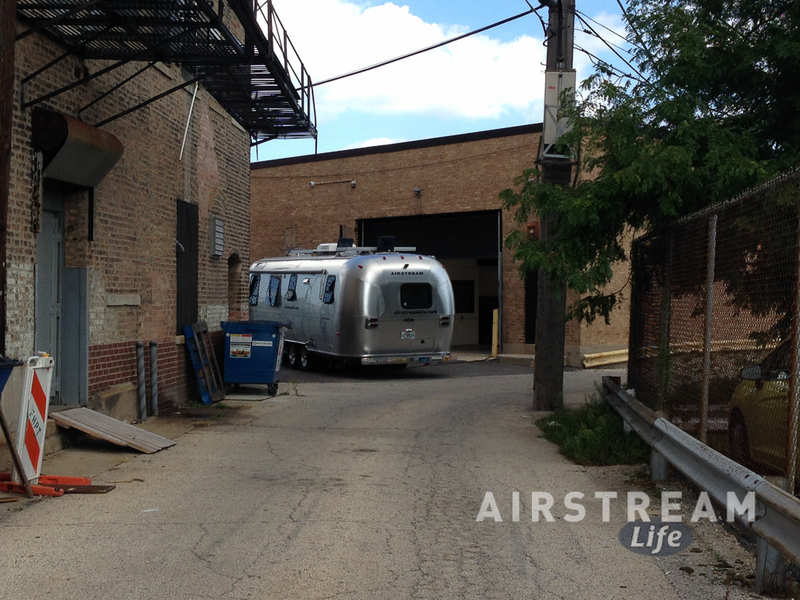 We have no source to fill the Airstream’s fresh water tank so it’s just a matter of conservation. We’ll be here a little over three days in total, which is easily covered by our 39-gallon tank plus a few jugs of drinking water. Electricity is normally not an issue thanks to rooftop solar panels that charge the Airstream’s big Lifeline 8D battery. But it was cloudy Sunday through Tuesday, and we were running all three roof vents 24 hours a day to cope with the heat, plus the fridge fans, so our power consumption was higher than usual. Without good sunshine for a full day, we needed to plug in get that power back. So while we were parked in an alleyway for a few hours (I’ll explain why in the next blog) I ran a cord to an ordinary 15-amp household-type outlet. You might be surprised to find that your Airstream uses very little electrical power, except when running the air conditioner or microwave oven. I’ve always said that living in an Airstream (or indeed many types of RVs) is one of the greenest lifestyle changes you can make. This is the first time I’ve bothered to actually calculate the electrical portion of it. The red/black meter is our Trimetric 2020, which is measuring the power going into the battery. 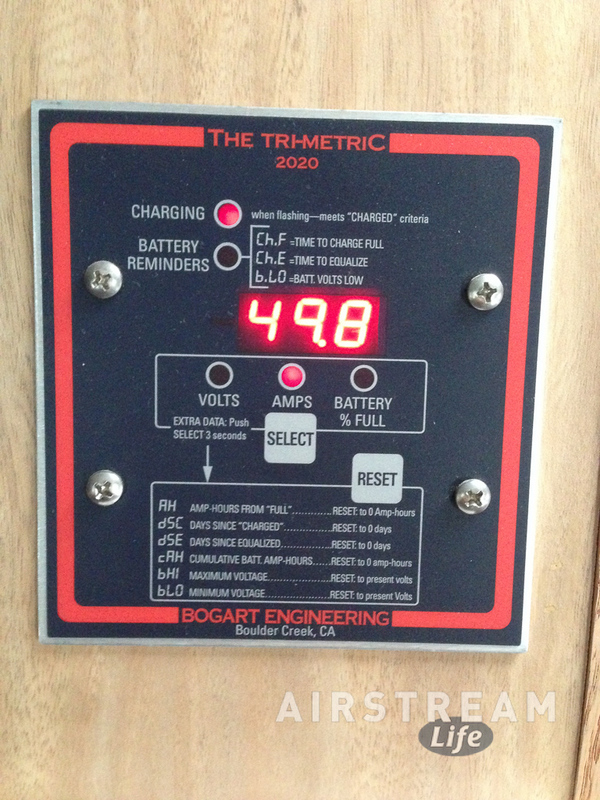 It’s showing that the Airstream’s built-in battery charger is running near maximum capacity (55 amps) with a net of 49.8 amps going into the battery at that moment. So this represents the peak consumption of our Airstream’s battery charger. What does that 49.8 amps translate to? You multiple the amps by 12 (volts) to get 598 watts. That’s not a lot of power when you consider that your coffee maker by itself will use 1,500 watts. Now here’s the curious part. 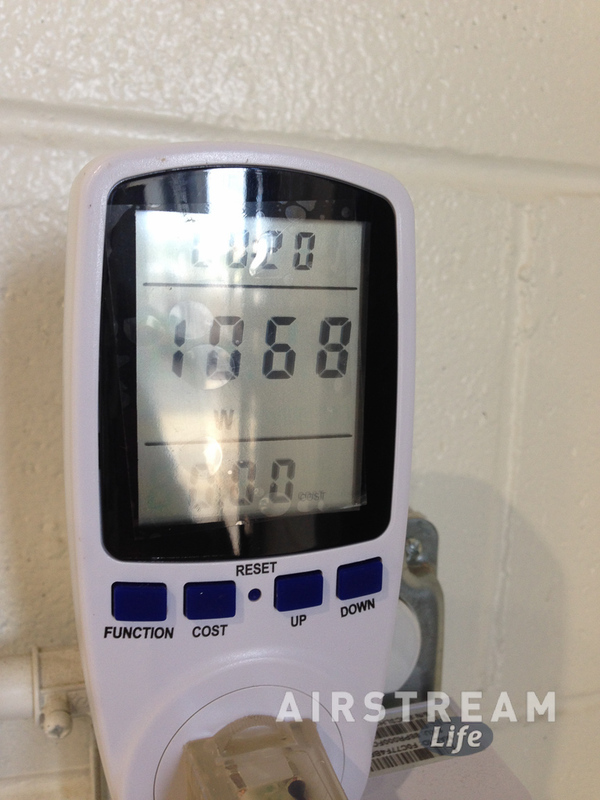 The white meter pictured is counting the watts at the plug, so it’s measuring all the power going into the Airstream. In the photo it’s showing that we were drawing 1,068 watts. Why the difference between 1,068 and 598 watts? It appears that somehow at least 470 watts are disappearing before they get to the battery. Actually, there are more than 470 watts disappearing. At the time these photos were taken, the rooftop solar panels were generating 119 watts of power that was also going into the battery bank. So of the 598 watts showing at the Tri-Metric meter, the battery was actually receiving 479 watts of power from the wall outlet and 119 from the solar panels. That leaves 589 watts of the 1,068 coming from the wall outlet (at the white wattmeter) unaccounted for. Those electrons were going somewhere else. Where? Some of that power was being consumed by appliances in the Airstream. The refrigerator was running on gas, but it still consumes a small amount of 12 volt power, as do many other appliances in standby mode. The total of all these “parasitic” power draws accounts for another 2.5 amps (on average in our trailer, YMMV), or 30 watts. That still leaves 559 watts missing. The ugly truth is that most of that 500 watts is going to waste, at the battery converter/charger. Sadly, most RV power converters are very inefficient, dissipating as much as half of the power they consume as heat. That’s why they have big cooling fins or cooling fans. A high-end charger will have something called Power Factor Correction to enable a much higher efficiency rate (95% is possible). But since most people will never notice the difference, it’s not something the RV industry suppliers tend to build into their converters. So in practical terms this 500 watt waste is not a big deal. We fully charged our Airstream, our two electric unicycles, electric scooter, all our i-devices and laptops, camera batteries, etc. and the wattmeter showed that we used only about 2 kilowatt-hours (kWh). That was our requirement for two days of life in the Airstream, electric toys included. To put that into perspective, our house uses an average of 54 kWh in the same amount of time, meaning that our electrical consumption for two days in Chicago was 27 times more efficient. Now to be fair, we didn’t run the air conditioning during our stay in Chicago and we definitely would have if the option was available, which would have brought our usage much higher. But still, it would have been a lot less power than living at home. Another way to look at it: we’re using about 10-12 cents worth of power a day. So you can see why it doesn’t really pay to upgrade to a more efficient power converter. Now that everything is re-charged, and Chicago is enjoying absolutely beautiful dry clear weather with temps in the mid-70s, we’ll enjoy another day in the city. The solar panels will easily keep up with whatever power we need, and even if they didn’t our full battery has plenty of capacity.